Stitch this funky free design ‘FLEUR-DE-LIS’ TOTE BAG ready to wear for this fall! 14 NEW CUSHION DESIGNS ! SIX MORE ART NOUVEAU CUSHION DESIGNS! 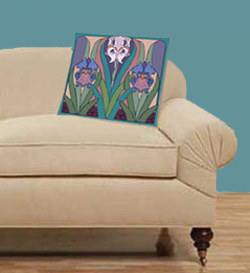 I had a great response from you when I originally introduced my Art Nouveau cushion designs to the ZIVA Collection. So I’ve created more to pique your interest! CLICK HERE to see these elegant designs that will work well in so many rooms of your home! EIGHT NEW ABSTRACT CUSHION DESIGNS! Have a look at these large bold cushion designs inspired by the Bauhaus, Mackintosh, Matisse and Morris Louis…design/art icons from the 20th century! CLICK HERE to see these new designs which will add a dramatic accent to your home! Many of you have asked me what’s in the ZIVA Needlepoint kits that I paint and assemble for you. So I added a page to help you see and understand exactly what you’ll receive when you order one of my kits. The Cross Stitch is normally associated with embroidery, but takes on a bolder appearance with needlepoint. The stitch can be used to outline an area or as a narrow border; it can also be a feature in itself used to create a bold squared- effect …perfect for developing graphic designs where clean straight corners are desired. So I created a several borders for this fleur-de-lis design (see above) with a series of squares…ideal for showing you the cross stitch with its simple, bold lines. I also used the same stitch to create the diagonal lines between the fleur-de-lis motif to make it ‘stand out’ visually from the tent stitch in the background. Work the stitch by bringing the needle up at 1, down at 2: the way you would normally stitch the tent stitch..
Then bring the needle back up at 3 and down at 4, to complete the cross. I prefer to complete each stitch as I go, but some prefer working all the diagonals in one direction first, and complete the cross on the return journey. 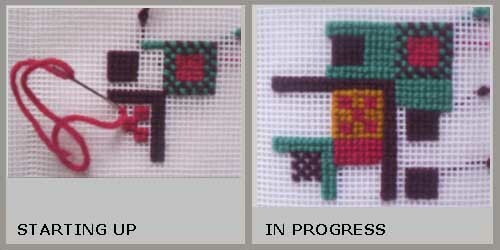 Turn the canvas around to stitch the next row, but always work the top diagonal in the same direction. The photo at right is what you want the cross stitch to look like when you’ve finished practicing it. Don’t worry what colour yarn you use at this stage, but you should practice with 4 ply wool tapestry yarn on a 10 gauge canvas at some point before you start. You could stitch the ’FLEUR-DE-LIS’ tapestry in the smaller size (photo above left) to create a square of approximately 7” (18 cm) .It has a cross-stitch border of wine-red squares in a gold background. Or you could add two more cross-stitch borders, one in red and one in turquoise (the latter also with wine-red squares) to create a tapestry panel of approximately 12” square (30 cm)(photo above right). For example, you could add just the red border for a tapestry square of approximately 9.5” (24 cm). Or add/repeat more borders! Why not? 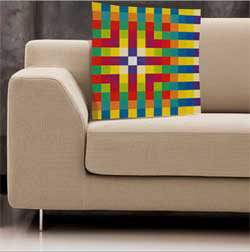 To reinforce the boldness of the design, I chose a 10 mesh gauge canvas (10 holes per inch). 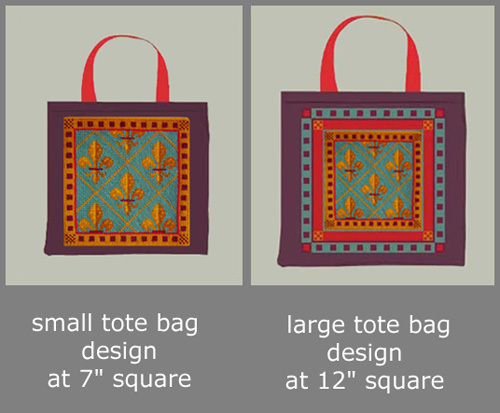 The first chart below shows the small fleur-de-lis tote bag design with its medium-gold border as designed. The second smaller chart shows the corner of the two additional borders (red and turquoise) to make up the larger tote bag. The design is repetitive. Remember all three borders are in the cross-stitch including the diagonals between the fleur-de-lis motif. 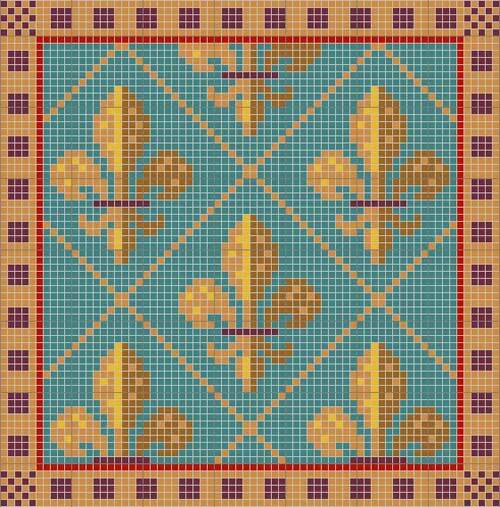 The central turquoise background and the fleur-de-lis pattern are in the tent basket-weave stitch. All the wool yarn colours as stitched are from the 4 ply APPLETON TAPESTRY WOOL Colour Range. approx. 18” square (approx. 46 cm square) to make up the large tote bag. Note: Interlock canvas is recommended in order to trim the canvas without any risk of it unravelling. I picked a dark wine-red medium weight cotton fabric for the rest of the bag, with bright red handles as shown above. But you could pick out any colour from the design to make up the bag. Allow the tote bag size to be at least 2” (5cm) larger than the tapestry on all sides, no matter the size of the tapestry you stitch. Finish the outside edge of the tapestry in a ‘loop stitch’ (also called whip stitch), in the same colour of the border or pick one of the other colours from the design for a contrasting border. 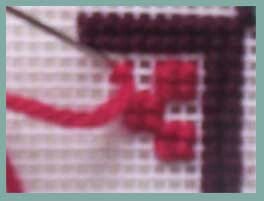 Click on EDGE STITCHES on the Sewing Needlepoint page to see how to do the loop stitch. Attach the tapestry to the sewn tote bag with fabric glue. Why not buy or use one of your existing tote bags and ‘dress it up’, like the one in the photograph? 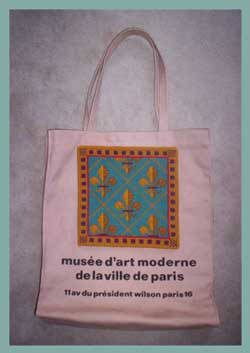 This natural canvas tote bag (approximately 12”x x15”) is one I bought in Paris years ago. You can fold the small Fleur-de-Lis tapestry and make up a stunning eye glasses case! Or you could take the larger Fleur-de-Lis tapestry and make up a cushionwith it! On average, a hank covers an area 6 inches by 6 inches or 36 sq inches, with a standard tent stitch. So using 36 sq inches a hank is a pretty good estimate. For a design with several colours, I usually estimate what the percentage of the tapestry that colour takes up as compared to the total number of hanks. That will help you determine how many hanks per colour are required. I hope that helps you, Diane. And thanks for subscribing to my VIVA ZIVA! Newsletter. New handbag designs coming in the fall! I’m presently designing and stitching new handbags that will be easy to make up for those of you who also like to sew! I’ve chosen an easy pattern from a well-known pattern supplier and have developed 4 new designs. Starting in the fall, I’ll introduce them to the site, as I get them finished. The next VIVA ZIVA! Newsletter #1007 will be issued in October 2010 . 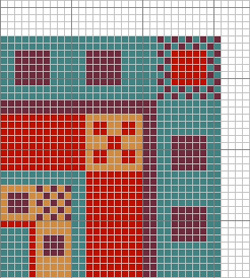 Free needlepoint design for a border pattern for a table runner for your Christmas table … perfect to stitch before the festive holidays!